This crocheted ear warmer is great for the cold outdoors. Just slip it onto your head and over your ears for a nice, cozy sensation. But beware, this elegant ear warmer is bound to attract admiring attention. Gauge Swatch: 3’’w x 2’’h (7.5cm x 5cm) ch 18. Need help understanding the abbreviations? Check out the crochet abbreviation chart. Using photo as a guide, attach flower to ear warmer with a yarn needle. If you have questions regarding this crochet pattern, feel from to leave a comment! 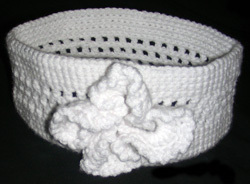 This entry was posted on Friday, February 13th, 2009 at 6:10 PM by Rachel Choi	and is filed under Free Crochet Patterns. You can follow any responses to this entry through the RSS 2.0 feed. You can leave a response, or trackback from your own site. Across means to work the stitch pattern all the way across the row. Check out the How to Read Crochet Patterns post for more examples. i made it and love how it came out. i didn’t do the flower though. i am making matching fingerless gloves and maybe a slouchy hat. thank you very much. what is your policy on selling items made from your patterns? not selling the pattern of course, just the item made. Hi D, you may sell the crocheted item, as long as you give credit to where you found the pattern. 1. In Round 3 I chain 10,skip 2 stitches and do a single crochet in the third OR do I read the instructions as skip 2 single crochet and slip stitch in the third? 2. In Round 5 (ch 3, sl st in next sc)… where do I do this bit? In the single crochets of Round 2? Hi Chitra, For you round 3 you skip 2 stitches, and then slip stitch in the third, not single crochet. In round 5, you (ch 3, sl st in next st), sorry it was suppose to say “st” not “sc”, I’ll fix that. They are made into the stitches on round 4. I loved crocheting this ear warmer. It turned out just darling with the flower! I sent the ear warmers to my daughter in England, where she is freezing! Do you have any mitten or leg warmer patterns? I’ve made quite a few items using your patterns and have loved all of them! Just wanted to say thanks! So I am a beginner and when I started making this design my first row did not match up. After doing my first set of sc I thought I would have an even round pattern but I didn’t is that suppose to happen? Hi Tammy, in this pattern you will be working in the round like a spiral. So it should look like a little taller after you finish a round. Let me know if you need more help. I am a beginner and love your website. I am learning a lot from you. I made the earwarmer and it looks great for a beginner. I am now working on the flower but I am having trouble understanding Round 3: I chained 10 skipped 2 sc, then sl st, but I don’t understand what around means. Can you help me? Hi Vicky, around means that are you going to repeat the instructions within the ( ) all the way around until you reach the first stitch you made on the round. Hi Rachel, Thanks for your quick reply. I have tried for two nights to get this flower completed but I am not getting past Round 3. I make the loops but then I am not sure where to begin after making the loops. Do I crochet on the inside of each loop? Thanks for your help. I can’t seem to understand round 4 for the flower. Where should I be doing this part? (sc, hdc, dc, 10 tr, dc, hdc, sc) In the 10 chains of the loops? I love this pattern by the way. Hi Cristal, you do all the stitches that are in the ( ) into the ch 10 loop, you’re working into the big space that is created by the ch 10. Here’s a tutorial that may help explain working in a chain space: What is a Chain Space (ch-sp)? This is beautiful. I just finished mine and I love it! Thank you. BTW, I love your creations. I am having trouble understanding round 9, because all I have on round 8 are spaces and double chochets. If it had total count of how many sc’s are supposed to be in round 9, I might be able to figure it out. Thank you. Also in rounds 6-8, it appears the earwarmer is getting smaller/decreasing, is that correct? Thanks again. Each round will have 90 sts on it. On rounds 6 – 8, half of the stitches will be double crochets and the other half will be chain stitches, but the total will still be 90. On round 9, you’ll have 90 single crochets. Can this be made for little girls and if so how man stitches would it be? Thanks in advance! Hello! An easy way to adjust the pattern would be to make a chain that fits snugly around the girl’s head. Everyone has a different sized head so this is an easy way to fit it. The chain should be an odd number. I just want to say a huge thank you for this lovely, elegant pattern. It was so easy to do, and very quick to make. Just what I was looking for. I have an MG sports car that, unless it’s raining, I always drive with the top down. In the winter I have a cute furry hat I wear, but now it’s warming up I wanted something not so wintry looking. I just now I’m going to make loads more, it looks fab! Signup to get crochet patterns, tutorials, and exclusive Crochet Spot content to your email! Hi! I'm Cara, get my free pattern when you signup! Crochet Pattern Copyrights What You Ought to Know About Shopping in the Store Amazon Shoppers Can Support Crochet Spot! Want to Be a Guest Writer on Crochet Spot?